I am largely an intellectual because of Soren Kierkegaard. I mean this primarily in terms of intellectual biography rather than genealogy. A few days ago I noted briefly my own vocational journey into English at the hands of T.S. Eliot. That is a true tale. However, at Eliot’s hands and through English alone as an undergraduate I largely wanted to be the next great poet or novelist. 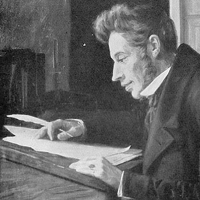 Kierkegaard taught me to think, or at least taught me that thinking was something a Christian could do, ought to do, with whatever capacity God had given him. Through Kierkegaard I came to Walker Percy, subject of my undergraduate thesis, and then John Updike, subject of my first scholarly essay, and probably too to literary and cultural theory which became a field of my doctoral studies and has remained a passion. 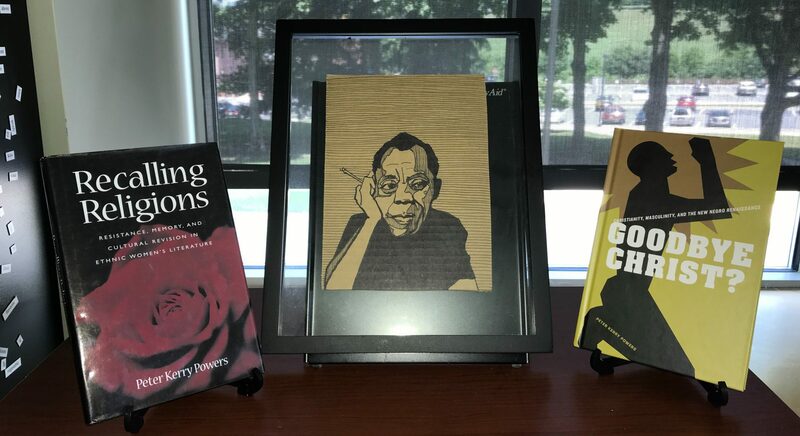 His writerly creativity, his playfulness with language image and authorial personae, never let me believe that critical writing was the inherent inferior to fiction, even if it is often practiced poorly. In honor of Kierkegaard’s birthday yesterday, I took down some of my old SK from the shelf and blew the dust off. The old Walter Lowrie paperback editions that were 3.95 back in the day. The rapturous and pious annotations that fill the margins are now cringe-inducing, but I am reminded of the passions an intellectual engagement deeply felt can arouse. A lot of the passages are marked over in four or five different colors of highlights and underlining, a way of trying to keep track, I suspect, of the many different readings I gave those book back in the day, a way of tracking the different person I was becoming. And if I now have moved a long way from those Kierkegaardian roots in to other hipper modes of thinking, I’m also of an age where I’ve started realizing that the newest thing is not necessarily a mark of the best thing, maybe only showing you what you already knew without realizing it rather than what you need to know. I still think The Great Dane wears well. His comments on sectarianism, as well as his more general clarity about easy piety, say something to our own age as equally as his. And, I still wonder sometimes, deep down, whether my first love was not the best. The true knight of faith is always absolute isolation, the false knight is sectarian. This sectarianism is an attempt to leap away from the narrow path of the paradox and become a tragic hero at a cheap price. The tragic hero expresses the universal and sacrifices himself for it. The sectarian punchinello, instead of that, has a private theatre, i.e. several good friends and comrades who represent the universal just about as well as the beadles in The Golden Snuffbox represent justice. The knight of faith, on the contrary, is the paradox, is the individual, absolutely nothing but the individual, without connections or pretensions. This is the terrible thing which the sectarian manikin cannot endure. For instead of learning from this terror that he is not capable of performing the great deed and then plainly admitting it (an act which I cannot but approve, because it is what I do) the manikin thinks that by uniting with several other manikins he will be able to do it. But that is quite out of the question. In the world of spirit no swindling is tolerated. A dozen sectaries join arms with one another, they know nothing whatever of the lonely temptations which await the knight of faith and which he dares not shun precisely because it would be still more dreadful if he were to press forward presumptuously. The sectaries deafen one another by their noise and racket, hold the dread off by their shrieks, and such a hallooing company of sportsmen think they are storming heaven and think they are on the same path as the knight of faith who in the solitude of the universe never hears any human voice but walks alone with his dreadful responsibility. The knight of faith is obliged to rely upon himself alone, he feels the pain of not being able to make himself intelligible to others, but he feels no vain desire to guide others. The pain is his assurance that he is in the right way, this vain desire he does not know, he is too serious for that. The false knight of faith readily betrays himself by this proficiency in guiding which he has acquired in an instant. He does not comprehend what it is all about, that if another individual is to take the same path, he must become entirely in the same way the individual and have no need of any man’s guidance, least of all the guidance of a man who would obtrude himself. At this point men leap aside, they cannot bear the martyrdom of being uncomprehended, and instead of this they choose conveniently enough the worldly admiration of their proficiency. The true knight of faith is a witness, never a teacher, and therein lies his deep humanity, which is worth a good deal more than this silly participation in others’ weal and woe which is honored by the name of sympathy, whereas in fact it is nothing but vanity. He who would only be a witness thereby avows that no man, not even the lowliest, needs another man’s sympathy or should be abased that another may be exalted. But since he did not win what he won at a cheap price, neither does he sell it out at a cheap price, he is not petty enough to take men’s admiration and give them in return his silent contempt, he knows that what is truly great is equally accessible to all. Either there is an absolute duty toward God, and if so it is the paradox here described, that the individual as the individual is higher than the universal and as the individual stands in an absolute relation to the absolute / or else faith never existed, because it has always existed, or, to put it differently, Abraham is lost. This entry was posted in biography, careers, Christianity, education, higher education, Humanities, intellectuals, liberal arts, literary criticism, philosophy, Reading, religion, Uncategorized, undergraduate research, writing and tagged Christianity, Fear and Trembling, intellectuals, John Updike, Kierkegaard, literary theory, Walker Percy on May 6, 2012 by Peter Kerry Powers. This entry was posted in poetry, religion, religions, spirituality on April 6, 2012 by Peter Kerry Powers.